CAMBRIDGE, MA - Graduating Harvard University Law School students stand and wave gavels in celebration at commencement ceremonies. Those fancy-pants, Ivy League colleges have gotten to be so expensive that only the wealthiest families can possibly afford them, especially during bleak economic times like these. Right? 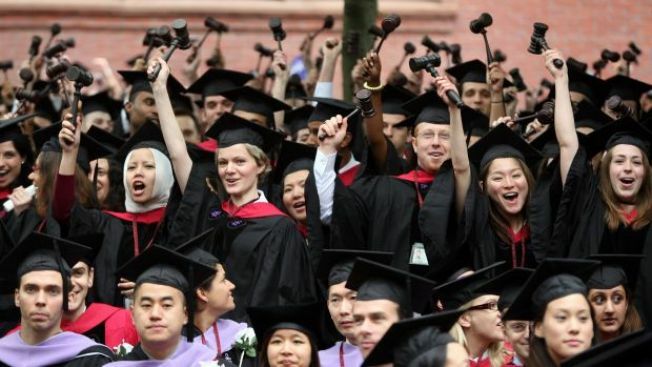 A new report called “Best Value Colleges for 2009,” issued Thursday by The Princeton Review and USA TODAY, spotlights 50 public and 50 private colleges and universities that do an exceptional job of helping qualifying students to pay for their higher education. This year, the University of Virginia in Charlottesville was named the No. 1 “Best Value Public College,” and Swarthmore College in Swarthmore, Pa., ranked as the No. 1 “Best Value Private College.” Both schools consistently meet 100 percent of the demonstrated financial need of their students — a trait shared by a number of schools featured in this year’s report. The report’s authors stress that even in this dark economic climate, oodles of free financial aid can be snatched up by college-bound students and parents who know how to play the game and ask the right questions. They’re not talking about student loans that can saddle students with crushing debt loads for years to come; they’re talking about scholarships and grants that never have to be repaid. “Don’t make the tragic mistake of crossing a school off your list because you’re intimidated by its sticker price,” said Rob Franek, vice president and publisher of the Princeton Review, an education company that helps students prepare for standardized tests such as the SAT. “The best advice for a family that might be humbled by this process is to equip yourself with as much information as possible,” he added. Franek said too many parents and high school juniors and seniors have no idea that top schools with the most recognizable names can actually be within reach for good students. As a consequence, they never even attempt to apply. “When we asked parents and students to name their number one fear about college, their fear was that they’d get into their school of choice but wouldn’t be able to pay for it,” Franek said. As they researched schools for their “Best Value” lists, the authors of the report didn’t focus solely on price. They surveyed administrators and students at more than 650 public and private colleges and universities and considered a variety of criteria, including the quality of each school’s academics, the costs of attendance and the amount of financial aid available. In the final analysis, “Best Value Colleges for 2009” provides descriptions of each school along with hard numbers that parents and high-school students can ruminate over together. Those numbers include the cost of attending each school, the average grant packages made available to students and the average indebtedness of graduates of each school. To see the entire “Best Value Colleges for 2009” report and access a database that provides in-depth details about each school, visit this USA TODAY site. To learn how to fill out a Free Application for Federal Student Aid (FAFSA) in the first few months of 2009, click here, here and here.